You’ve heard me complain about the cost of owning a pool before. Well, the problem of being a homeowner is that when something breaks, you’re on the hook to fix it. Such was the case with our pool recently when we asked a couple contractors to come over and give us an estimate to replace some caulking around the pool and above the waterline tiles. It turned out to be much more work than just doing some caulking. The first contractor who came over did some “tap tests” along the brick coping (the darker brick that frames our pool in the photo below) and found that at least half of the coping made a hollow sound when tapped. That meant the “mud” compound that secured the brick to the top of the pool wall had eroded away and now water was getting between the brick and pool cement and could cause significant damage, if it hadn’t already. The second contractor also found the same problem. I’ll shorten the story to say that if we replaced the brick coping, we would also need to replace the tile (attached to the top of the pool wall, just under the brick) due to the way they remove the brick. We would also need to drain the entire pool (covered in “Save Money on Water if You Have A Pool“), which meant filling it back up again. Oh, and they also found that our top step was collapsing from within, so it would need to be cut out, re-poured and re-plastered. Total negotiated cost: $7,000. And that was down from over $8,500! Ok, so we needed to make some home repairs. While it could have waited, we chose to do the work now since we have the money rather than wait and something bad and unexpected to happen. If that were to occur, then what if we had to sell the house and then the pool problem was found then (or had gotten much worse), we’d be in trouble. But luckily we had the money in our home repair bank account and it didn’t impact our budget (except to continue replenishing the account). No? Can’t find anything? Well, outside of the worn out caulk between the brick and the cement patio, which you can only see in person and by looking closely, the average home buyer wouldn’t notice anything wrong with our pool. And that’s the problem with home repairs: Often you put tons of money into a repair that brings no added value to the home. At most, the repair might save you from losing money, but it won’t cause people to say “wow, I’m willing to pay $7,000 more for this house because there’s now a barrier of sealed mud between the brick and pool wall”. We won’t even see that money on a home appraisal when we need to refinance our mortgage. It’s not like a renovated bathroom or kitchen where you can see a marked improvement. It’s hidden away somewhere you’ll never, ever see, and only a seasoned home inspector will find it if it’s gone bad. We’re still filling the pool in that photo, and the caulking around the coping wasn’t done yet, but that’s basically what changed. Would you, as a buyer, notice anything other than the color change between the first photo and this one? No. Next up in the spring will be to replace the top row of the retaining walls (partially visible in the photo above) with a red capstone. Then we’ll plant some bushes, etc. with other colors of the rainbow so it’s not too much red back there! So that’s where a lot of my time and money went in September and October. We painted by hand and brush rather than a paint sprayer, and I’m very please with the results. 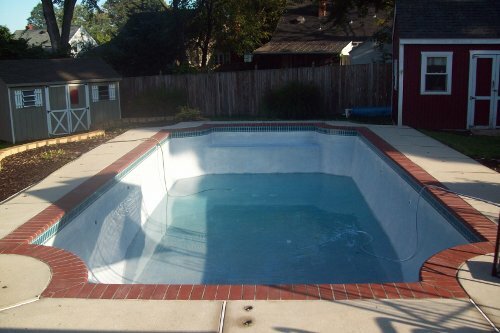 The funny part is we’ll get far more compliments from the $100 paint job than the $7,000 pool repair. Great story and the pictures really add to it. 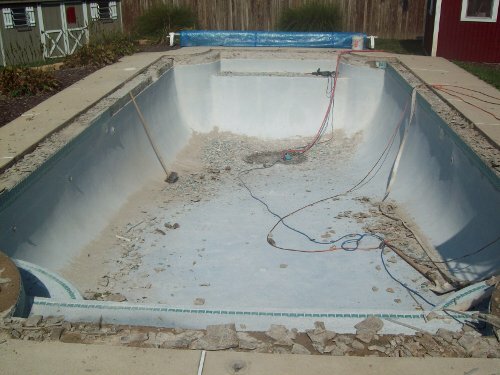 An unfortunate situation there, but having a safe pool will give you a lot more peace of mind over the next few years. Another moral of this story: Don’t forget the small things around a house (like a $100 paint job), because they can add much more value than big jobs. I liken this to people spending thousands of dollars inside the house, but forgetting to get a $25 mowing job done before they sell a house. Yeah..my wife and I just moved into our new home in July. We need to get that home maintenance emergency fund started. Murphy will come and visit. I am envious that you could paint into October, I started my paint job, got stopped from bad weather in the end of September, Now I have a multi-color house until spring thaw in Alaska. The paint job looks beautiful though, even if that is all buyers would notice. I thought you may be interested in a way to save some money on heating that great pool. I work with Low Cost Power, and they can save you as much as $250 on your current energy cost. It’s worked wonders for my energy expenses. 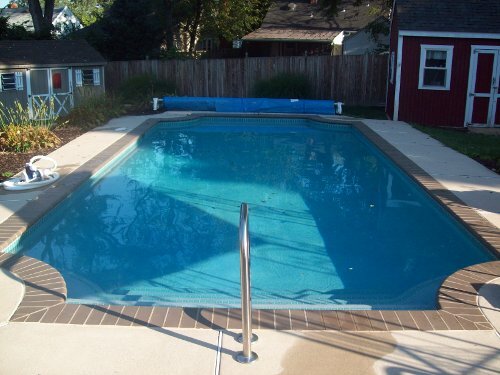 @Michael, I use a solar cover to warm my pool. Costs $100 (plus the $200 for the reel to wind it up) and lasts about 2 years. Got the pool up to 95 degrees the past few summers.